The mystery rites celebrated in her honor – and that is what they were, mystery rites, – were held in May and December under the strictest conditions of secrecy and cloaked in deepest mystery. We know a great deal more about the Winter celebration than the quieter rite of May, about which we know remarkably little, but as a result of conjecture and inference, the two distinct rites have become inseparably fused in the discussions of every commentator beginning with Plutarch and Macrobius, Ovid and Juvenal, and continuing down to the present day. The first rite was celebrated on the first day of May at her temple situated in “a natural knoll” (6) at the rocky “peak of the Aventine.” (7) Its observance, as Ovid tells us in his Fasti, is marked in the official religious calendar as being the date of the actual comem-oration of her temple which, he notes, was founded by the Senate. (8) The second, a nocturnal rite, was celebrated far from this sacred ground “in the house of a consul or praetor.” (9) It was a moveable feast “occurring between the Kalends and the Nones” (10) of early December, that is to say, between the calling of the first sighting of the crescent moon and the ninth day before the Ides. The emphatic exclusion of males is the rule applied to any religious practice whose concern is with the blood mysteries of women. On this basis alone, without knowledge of a single other element of her worship, it would be reasonable to conclude that Bona Dea’s worship centered upon the vital concerns of the reproductive lives of women. However, we are fortunate to have at our disposal, in addition to the monumental proof of her worshippers’ offerings, conclusive proof of such an obvious and logical assump-tion by way of the bare-bones outline of her rite provided by Roman authors – males – who, being forbidden access, gathered what they could by hearsay, and reported what little they had gleaned from extremely limited observation at a very polite distance. One senses that they knew all too well the nature of the goings-on from which their eyes were shielded and their tongues forbidden to speak. Of necessity, their documentation is weighted with euphemism so as to avoid the “unmentionables” of female reality. As we shall see, such veiled language is not restricted to those excluded from Bona Dea’s cele-brations, but extends also into her rites as a primary feature of this goddess’s mysteries. Our re-sifting of the symbolic elements of the actual ritual observances that have come down to us through shielded male eyes, begins with what we know of her temple on the hill of the Aventine, that “temple which abhors the eyes of males.” (20) It was a place of healing, which has been described as “a kind of herbarium in which herbs were kept with healing properties. . . . This attribute of the goddess is borne out by the presence of snakes in her temple, the usual symbol of the medicinal art . . . .” (21) The priestesses of this center of healing seem to have had a deep understanding of the subtleties of the healing arts, most especially with regard to reproduction. who is rarely, if ever, a goddess of childbirth. It is a most unusual, and probably late, combination. In Greece we find that “the myrtle was sacred to Artemis Soteira, ‘saviour’ of women in childbirth,” (27) and this, probably because “the myrtle prevented premature delivery by closing the uterus.” (28) But the Roman worship of Bona Dea must have been concerned with timely births, for the closing of the uterus would be anti-thetical to such a purpose. Despite the ban on myrtle, there was another way in which the pudenda muliebra was represented at Bona Dea’s December rite, and that was through the chosen animal of sacrifice, the porca, or sow. The choice of the highly prolific pig as the sacrificial victim was the norm rather than the exception in the ancient rites of female divinities, but there is a special, and secret, relationship to the Greek Demeter that is here stressed. The women of ancient Greece always sacrificed the pig as the most honorable of offerings to Demeter at all of her festivals They did so most notably, and in unprecedented numbers, at the Eleusinian Mysteries. (29) The sow was known as the delphas, or 'uterine animal', symbolizing her fertile earth-womb. The prolific pig was so identified with the life-giving womb that the pudenda muliebra was commonly vulgarized in Greek by the word for ‘pig’, choeros, (30) and similarly so in Latin, with its equivalent in the word porcum. We know that on Bona Dea’s feast day of May 1st “a pregnant sow was sacrificed to the goddess and very mysterious rites were performed. . . . In fact this is the only information we have about this feast. The additional details . . . refer to the celebration in December.” (32) At her not-so-secretive winter rite, numerous sources agree that the sacrifice of a pig was performed at the hands of the sacrosanct Vestal virgins. We have every reason to believe that the animal would have been a pregnant sow. That very strong sense of Demeter’s presence in these Roman mysteries is felt not only in the choice of sacrifice, but in the direct correspondence of the distinctly Greek names attached to the sacrificial victim, to the priestesses, and to the ‘Good Goddess’ herself. Other elements of this rite that are as closely guarded as these secrets of naming, similarly point to an ancient worship of this goddess of the earth. These are seen in the measures that were taken to conceal forbidden wine that was taken into both the magis-trate’s house and the temple under the name of ‘milk’, and carried, with intended humor, in a container known as a mellarium, or ‘honey-pot’. (36) Aside from the hilarious sexual humor, and the game in which the participants themselves refer to the elements of the ritual by way of euphemism, instead of men doing it for them, there is a far deeper, very dark secret, in this game of concealment. We know that milk and honey were customary offerings to the earth from earliest times. We know also, not only from close examination of the rites of underworld female deities, but from the written record of Sophocles’s Oedipus at Colonus, that only wineless offerings were made to such goddesses. (37) This must have been the rule in the earliest phases of Bona Dea’s worship because the practice was both ubiquitous and universal in the ancient world. The minute details of such a presentation of wineless libations to the underworld goddesses, which in this case is a 5th century B.C.E. rite of expiation offered by Oedipus to the Eumenides, are spelled out in their entirety by Sophocles in his last play. Whose ground you violated when you came. In what way shall I do so? Tell me, friends. That runs forever; and bring them with clean hands. And when I have that holy water, then? Put chaplets round the brims, over the handles. Of myrtle sprigs, or woolen stuff? Of what? Take the fleeces cropped from a young lamb. Just so; then how must I perform the rite? Am I to pour them from the bowls you speak of? In three streams, yes; the last one, empty it. With what should it be filled? Tell me this, too. With water and honey; but with no wine added. And when the leaf-dark earth receives it? I am eager to hear this, for it has great power. The suppliant and his wish. This is a beautifully moving translation, but there is one very large error. In the original Greek text the word “myrtle” does not appear. The translator has inserted his own very impressive knowledge about underworld deities into the text. Sophocles does not name the sprigs. He says, simply, “thalloisin,” (39) which means ‘young shoot, young branch’. (40) This information is more useful to us than it might at first seem, for it solves the question of why myrtle is so abhorred by Bona Dea. She, like Demeter, and Damia, and Hekate, and the Eumenides, or Erinyes, are firmly rooted in the earth. The snakes in her temple are not only a sign of the healing arts, but an emblem of the underworld deity herself. The rites of the chthonian deities, among whom Bona Dea must be numbered, are lathered in euphemism for the reason that these goddesses are so holy that one cannot bear to look at them, nor call them by name. The original purpose of the euphemism was ‘to use a good or auspicious word for an evil or inauspicious [one]’. It derives from euphemos, ‘of good sound or omen’, which literally means, ‘good voice’. (44) We have seen the necessity of this religious practice acted out before our very eyes in the Oedipus at Colonus. Those whom the Greeks called the Eumenides, ‘the kindly, propitious ones’, (45) were, in fact, the Furies. These are the Erinyes, ‘the avengers’, known also as the Semnai, ‘the august, holy, solemn, awful ones’. Their individual names tell us in no uncertain terms who they are. They are named Tisiphone, ‘retributive justice for homicide’, Megaera, ‘to withhold from envy a thing too great’, and Alecto, ‘to ward off, avert, defend; and to repay’. (46) These triple-goddesses are the staunch defenders of what Jane Ellen Harrison has called “gynaecocracy,” (47) and what others call “matriarchy,” terms meant to convey women’s power in the religious rather than the political sense. Those who violate the morality of the ancient religion are avenged. The Furies are thus the enemy of patriarchy and so are portrayed as evil, vile monsters. They are both ‘holy’ and ‘awful’ at the same time; greatly feared and revered. (48) And what of the ‘Good Goddess’, Bona Dea, with the secret name? They say that Demeter, herself, was once an Eriny “when the earth-goddess reigned below.” (49) She, along with her daughter Persephone, are the beloved “awful goddesses” of the great Eleusinian Mysteries (50) to whom the offerings of piglets were so profuse that Aristophanes remarked that “the whole region surrounding the initiation site smelled of roast pork.” (51) And this, perhaps, was the situation with the very public secret rites of Bona Dea-Damia-Demeter on an infinitely reduced scale. As was the case with women’s mysteries in general, their concealment from those outside the circle of women was so threatening that they became the object of derision. It is, indeed, shocking that they remain so today, as is evidenced in the numerous examples that we have cited of skewed perspectives and derogatory language used throughout The New York Times article, “Women’s Cults of Antiquity: The Veil Rises,” which purports to document some of the findings of the excavations of Bona Dea’s Temple at Paestum. (52) As we have described in other articles on this site, when women's rites were somewhat open to public view, despite the fact that their actual meaning was misconstrued, they were adapted to patriarchal purpose and acknowledged as indispensable to the very survival of the community in its entirety. We see this in the exclusively-female rites of Juno and Vesta in Rome, (53) and this is certainly the case with the Mysteries of Demeter and Persephone at Eleusis, which were eventually inclusive of men, and to which the Romans eventually flocked in great numbers. FRONTISPIECE: AN ALTAR DEDICATED TO “BONAE DEAE” BY CAIENA OF ATTICA, A FREED-WOMAN OF THE PROSCA FAMILY, MINISTRANT OF BONA DEA, IS “DECORATED WITH A WREATH OF OAK-LEAVES WITH FLUTTERING RIBBONS . . . [AND] TWO EARS WITH EAR-RINGS”. 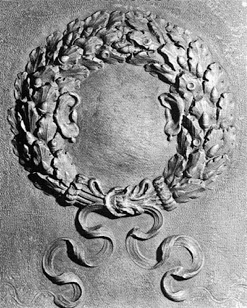 THERE IS THE BAREST HINT OF A FACE IN THE SLIGHTLY PROTRUDING ROUNDED AREA INSIDE THE WREATH. UNCOVERED IN 1758 DURING THE BUILDING OF THE MAIN ENTRY PORCH OF THE CHURCH OF NOTRE-DAME LA MAJOR AT ARLES, WHERE ONCE STOOD A TEMPLE OF CYBELE. 1ST CENTURY C.E. WHITE MARBLE ALTAR. MUSEE LAPIDAIRE D’ART PAIEN, ARLES, FRANCE. From: H. H. J. Brouwer, Bona Dea: The Sources and A Description of the Cult. (Leiden: E. J. Brill, 1989), Part One, The Archaeological and Epigraphic Sources, p. 131, and p. 131, Note 319, in reference to Image 130., Plates XLVI and XLVII; full inscription on p. 132, and p. 132, Note 325 in French. 1. This image literally puts a face on the exact intention of the suppliant whose prayers were dedicated “TO THE EARS OF BONA DEA.” We note, also, that Demeter’s early role as the goddess of the oak, queen of the ancient woodlands, is preserved – with all of her attendant Dryad nymphs – in Ovid’s telling of “The Sacrilege of Erysichthon” in his Metamorphoses, which appears in the Appendix following the Notes for: Tracy Boyd, “I Am Baubo, The Acorn Fool” at <www.sacredthreads.net>. 2. Quoted from an inscription given by a magistra of Bona Dea for a suppliant, dedicated “To the ears of Bona Dea.” Cited with full documentation in (H. H. J. Brouwer, Bona Dea: The Sources and A Description of the Cult, op. cit., Part One, The Archaeological and Epigraphic Sources, p. 113.) This dedication is entirely separate and distinct from the Bona Dea altar. This magnificent oak-leaved image that we have chosen for the Frontispiece leaves no doubt (no pun intended) that in the mind of the woman who dedicated this altar – a ministrant of the goddess who knew her deity intimately – Bona Dea was still a nymph of the oak, a Dryad. As we have said, one can almost make out a face in the rounded area inside the wreath between the thoughtfully decorated ears. 3. W. Warde Fowler, "Bona Dea", in The Encyclopedia Britannica. (Cambridge, England: The University Press, 11th edition, 1910-11), Vol. IV, p. 191. 4. W. Warde Fowler, The Roman Festivals of the Period of the Republic: An Introduction to the Study of the Religion of the Romans. (London: Macmillan and Co., Ltd., 1933), p. 106. 5. All are quotations from Ibid. 6. Ovid, Fasti. Sir James George Frazer, Translation and Commentary. (Cambridge, MA: Harvard University Press, Loeb Classical Library, 1931-1976), Book V, 153, p. 271. 7. Ibid., Translator’s Note e.
8. Ovid, Fasti, op. cit., Book V, 153, p. 271. 9. W. Warde Fowler, The Roman Festivals of the Period of the Republic: An Introduction to the Study of the Religion of the Romans, op. cit., p. 256. 12. H. H. J. Brouwer, Bona Dea: The Sources and A Description of the Cult, op. cit., p. 257. Originally a 1982 doctoral thesis at the University if Utrecht, this book is a rigorous and dedicated scholarly study of everything there is to know about Bona Dea. Published some years after this article was initially written, its deeply researched information was unavailable as a source at that time. In the minor revisions for this publication, we have quoted a few of Brouwer’s many irresistible tidbits. 13. Juvenal, Satires, 2. 83; 6. 314. 14. 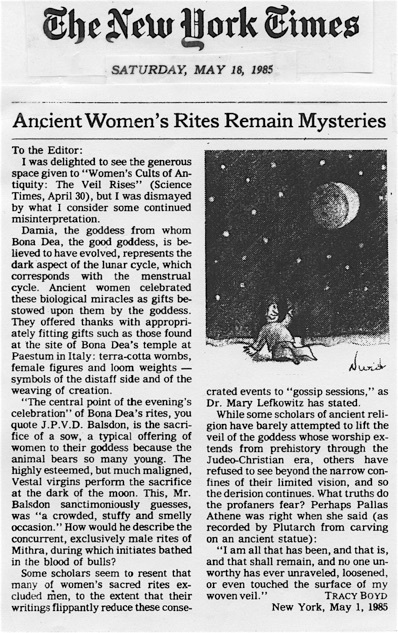 See the statement of Mary R. Lefkowitz, Andrew W. Mellon Professor in the Humanities at Wellesley College, in Eric Pace, "Women's Cults of Antiquity: The Veil Rises", in The New York Times, April 30, 1985 at <http://www.nytimes.com/1985/04/30/science/women-s-cults-of-antiquity-the-veil-rises.html>; and a response by Tracy Boyd, "Ancient Women's Rites Remain Mysteries" in The New York Times, Letter to the Editor, May 18, 1985, here reproduced following the Notes to “Bona Dea’s Secret Rites”. 15. Eric Pace, "Women's Cults of Antiquity: The Veil Rises", op. cit., is here quoting J. P. V. D. Balsdon’s 1962 book, Roman Women: Their History and Habits. 16. W. Warde Fowler, The Roman Festivals of the Period of the Republic: An Introduction to the Study of the Religion of the Romans, op. cit., p. 106, who doesn’t see the connection. 17. For detailed discussions of Vesta and Juno, see: Tracy Boyd, “The Keepers of the Flame: Vesta and Her Brides” at <www.sacredthreads.net>. “Bona Dea’s Secret Rites” was originally included as a section of that long article. 18. See: Eric Pace, "Women's Cults of Antiquity: The Veil Rises", op. cit. 19. For a discussion of the importance of weaving as it pertains to birth, see Tracy Boyd, “The Eternal Weaver” at <www.sacredthreads.net>. This article, without mention of it, offers a prima facie refutation of the archaeologist’s uninformed assumption that the loomweights “were left as offerings by poor women who could afford nothing more elaborate.” (This ignorant statement made by Dr. John Griffiths Pedley, Field Director of the excavations at Paestum, under the auspices of the University of Michigan, is quoted in Eric Pace, "Women's Cults of Antiquity: The Veil Rises", op. cit. 20. Ovid, Fasti, op. cit., Book V, 153, p. 271. 21. W. Warde Fowler, The Roman Festivals of the Period of the Republic: An Introduction to the Study of the Religion of the Romans, op. cit., p. 104. 22. The Oxford Universal Dictionary of Historical Principles. William Little, H. W. Fowler, J. Coulson, Preparers, C. T. Onions, Editor/Revisions, (Oxford: The Clarendon Press, 3rd edition, 1933-1955), “myrtle”, p. 1305. 23. Marcel Detienne, The Gardens of Adonis: Spices in Greek Mythology. Janet Lloyd, Trans. (Princeton: Princeton University Press, 1994), pp. 62-63. 24. A Greek-English Lexicon. Compiled by Henry George Liddell and Robert Scott. (Oxford: Oxford University Press, 9th ed., 1983), “myrton”, p. 1155. 25. Webster’s New World Dictionary of the American Language. College Edition. (Cleveland and New York: The World Publishing Co., 1959), was consulted for all of these descriptions. 26. Eric Pace, "Women's Cults of Antiquity: The Veil Rises", op. cit. 27. George Thomson, Studies in Ancient Greek Society: The Prehistoric Aegean. (NY: The Citadel Press, 1965), p. 218, quot. Paus. 3. 16.11. 28. Ibid., p. 218, quot. Pliny, Nat. Hist. 23.159-60; 24.50; 21.126. 29. See: Tracy Boyd, “I Am Baubo, the Acorn Fool” at <www.sacredthreads.net>. 30. George Thomson, Studies in Ancient Greek Society: The Prehistoric Aegean, op. cit., p. 222. 31. Oxford Latin Dictionary. P. G. W. Glare, Editor. (Oxford: The Clarendon Press, 1985), “porcus”, p. 1405, quot. Varro, De Re Rustica, 2.4.10. 32. H. H. J. Brouwer, Bona Dea: The Sources and A Description of the Cult, op. cit., p. 370, relying upon the authority of Macrobius, relying upon Cornelius Labeo. 33. A Greek-English Lexicon. Compiled by Henry George Liddell and Robert Scott, op. cit.,“da”, p. 364., “ga”, “gaia”, p. 335, “ge”, p. 347. 34. Funk & Wagnalls Standard Dictionary of Folklore Mythology and Legend. Maria Leach, Editor. Jerome Fried, Assoc. Editor. (New York: Funk & Wagnalls Company, 1949), “Bona Dea”, Vol. I, p. 154. 35. W. Warde Fowler, The Roman Festivals of the Period of the Republic: An Introduction to the Study of the Religion of the Romans, op. cit., pp. 105-06. 36. Ibid., p. 103, quot. Macrobius I.12.25; and Pluarch. Quaest. Rom., 20. 37. Jane Ellen Harrison, Prolegomena to the Study of Greek Religion. (New York: Meridian Books, 1955), pp. 90-93.) writes about this in some great detail, even quoting Sophocles as I, too, have done, independently and with a very different perspective. 38. Sophocles, Oedipus at Colonus, in Sophocles: The Oedipus Cycle: An English Version. Robert Fitzgerald, Translator. (San Diego, New York, London: A Harvest/HBJ Book, Harcourt Brace Jovanovich, Publishers, 1939-1977), Scene II, pp. 105-07. 39. Sophocles, Oedipus at Colonus. Hugh Lloyd-Jones, Editor, Translator. (Cambridge, MA. : Harvard University Press, Loeb Classical Library, Vol. 21, 1994-1998), line 474, p. 464. 40. A Greek-English Lexicon. Compiled by Henry George Liddell and Robert Scott, op. cit., “thallos”, p. 782. 41. George E. Mylonas, Eleusis and the Eleusinian Mysteries. (Princeton: Princeton University Press, 1969, p. 211. 44. Webster’s New World Dictionary of the American Language, op. cit., “euphemism”, p. 501. 45. See: Robert Graves, The Greek Myths. Two Volumes. (Harmondsworth, Middlesex: Penguin Books Ltd., 1955, 1960), in “The Gods of the Underworld”, Vol. I, 31g., p. 122. 46. See: Tracy Boyd, “The Furies”, in “The Power of Naming: Notes for a True Reading of Oedipus Rex”, 1979 soon to be posted at <www.sacredthreads.net>. 47. Lewis Richard Farnell, The Cults of the Greek States. Five Volumes. (Chicago: Aegaean Press Inc., MCMLXXI), Vol. I, p. 199, quoting (and criticizing) Jane Ellen Harrison in “The Classical Review” of 1893, p. 74. 48. Tracy Boyd, “The Furies”, in “The Power of Naming: Notes for a True Reading of Oedipus Rex”, op. cit. at <www.sacredthreads.net>. 49. Lewis Richard Farnell, The Cults of the Greek States, op. cit., Vol. 3, p. 117. 50. See: Tracy Boyd, “I Am Baubo, the Acorn Fool” at www.sacredthreads.net. 51. C. Kerenyi, Eleusis: Archetypal Image of Mother and Daughter. Ralph Manheim, Translator. (New York: Schocken Books, 1977), p. 56, quot. Aristophanes, Ranae 338. 53. See, for example: Tracy Boyd, “The Keepers of the Flame: Vesta and Her Brides”, especially under the heading: “Thrice-Nine Virgins” at <www.sacredthreads.net>. 54. George E. Mylonas, Eleusis and the Eleusinian Mysteries, op. cit., p. 161. 58. See: Tracy Boyd, “I Am Baubo, The Acorn Fool” at <www.sacredthreads.net>. 59. George E. Mylonas, Eleusis and the Eleusinian Mysteries, op. cit., p. 285. 61. Plutarch, The Parallel Lives: The Life of Julius Caesar. (Loeb Classical Library Edition, 1919), Vol. VII, 9.4, p. 463-64. Edited by Bill Thayer at <http://penelope.uchicago.edu/Thayer/E/Roman/Texts/Plutarch/Lives/Caesar*.html>.